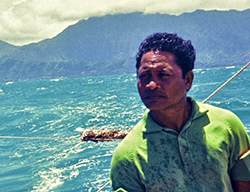 Clifford Ah Mow was a crew member on the 1976 voyage to Tahiti and was O Ke Kai, of the sea. Like his ancestors of past and present, Clifford was intuitive and could sense situations and people. 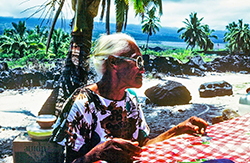 Meticulous in preplanning his deep dives or any activities relating to the kai, Clifford, like all other Ohana Wa'a of 1976, believe that everything in nature are family, exactly who their teacher Mau Piailug looks to to find his island. A family of the canoe, Ohana Wa'a, understood that their kuleana was that of hana'i parents to a living cultural artifact, Hokule'a. Albeit a replica of the first artifact of their ancestors, the first people, everyone who came to care for her, provided nurturing and comfort with Aloha, mele, oli and hula, and for that we were subjected to cruel and unusual punishment. With strength from the original ohana wa'a, all we have is Ha, the breath of life for anyone in need. This video provides incontrovertible evidence of cruel and unusual punishment to Hawaiian participants of the Hokule'a project in 1975-1976. Ordered to meet a contractual agreement to celebrate the 200th anniversary of the Declaration of Independence, life-safety and cultural values were blatantly compromised to meet this deadline for the purposes of public relations, product marketing, and hero-worship posturing. This video provides substantial evidence of human, cultural, and civl rights violations not yet addressed by way of ho’oponopono, human resources assist, or any form of reconciliatory efforts. 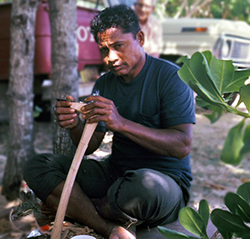 Days prior to the launching of Hokule'a, Hawaiian authority and chanter, Kaupena Wong, came to Kualoa to sample two chants he would use for the launching. Following the crossing of the infamous Alenuihaha Channel, a first for Hokule'a, Kimo interviews well-respected Lahaina, Maui shipwrights, John Whitenburg an Drake Thomas. Kimo then interviews Maui sailing canoe builder, Levan Sequira. 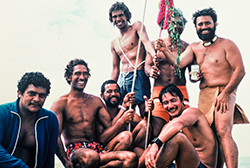 Hokule'a makes her first crossing of the infamous Alenuihaha Channel on June 14, 1975, and after coming into calmer waters outside of Kailua, Kona, Kimo continues to interview crew members from Maui who were chosen to make this treacherous crossing. Kimo begins this podcast by reading excerpts from page 62 of Chapter Five where he describes a barren and hot coastline as Hokule'a is drifting without any wind. Someone, however, someone with great mana finds Hokule'a. This recording was made on the grounds of Hale O Keawe in 1975. The tape is of Aunty Clara and Papa Abraham Moses telling riddles and jokes in Hawaiian and challenging each other to the translation, the meaning. Mau returned to Hawaii on Christmas Day, 1975, and he and Kimo discuss Mau's plans for the first voyage to Tahiti. Kimo asks Mau if he encounters whales. Mau speaks about the birds in Hawaii and he refers to them as Okule'a. Kimo asks Mau how long to reach Tahiti and the preferred size of the crew. Kimo asks about the supply of water and coconuts. Mau states that he always drinks beer when he sails and beer should be on Hokule'a to Tahiti. This is a continuation of Kimo and Mau discussing Mau's navigation and plans for the first voyage to Tahiti. Mau describes the types of birds he looks for. Again, he refers to these birds as Okule'a. Kimo asks about satellites and then asks Mau if he has seen flying saucers. Kimo describes funny people coming from planets like Mars. 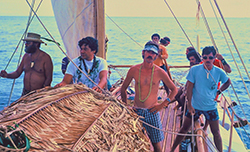 1977 Radio Interview with KKUA personality Ron Jacobs and Tom Skinner, an executive producer of the National Geographic documentary, "Hokule'a."